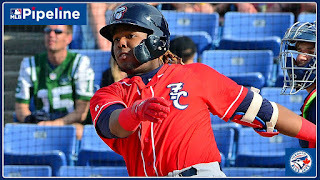 With Juan Soto now playing everyday in the outfield for the Washington Nationls (.286/.400/.571 - 25 PA), we can finally shift our attention towards Vladimir Guerrero Jr.. The Blue Jays future Superstar 3B has been putting on a show at AA-New Hampshire with 17 doubles, 10 home runs and a ridiculous .431 AVG! The way the Nationals moved Soto through their farm system this year, people are wondering why Vlad Jr. is still crushing AA pitching and has not been advanced to AAA-Buffalo - or even just straight to the MLB. Guerrero Jr. has the most points scored over the last two weeks by more than 30 fantasy points! He is hitting over .500 during that stretch, with five of his 10 home runs. That has accounted for nearly 39% of his season total points. Cedric Mullins (Orioles, OF) has scored 44% of his season total points over the past 14 days, thanks to 25 hits and six walks over his last 59 plate appearances. The Los Angeles Angels have two prospects of their own that are swinging hot bats. Down at AA-Mobile, Jared Walsh has hit five home runs and drawn 12 walks while Matt Thaiss has 10 XBH and seven base on balls in his last 61 PAs. He was recently promoted to AAA-Salt Lake and has 6 XBH in six games. Both play 1B, but Thaiss is the better prospect, ranked 8th in the Angels organization.